Firepower as we know it today is all but abandoned with Granada. Granada uses shields and radar to create its defense mechanism. Offensive firepower is provided by the most awesome array of weaponry ever assembled on a battlefield. These include multi-directional interceptors, long-range homing missiles, and a device designed to totally obliterate all opposing forces. If you enjoy fast paced action-packed thrills, you'll love the feel and sound of Granada. --From the Genesis Granada instruction manual. Granada is a thing everyone knows about, but barely anyone lives to see it. It has no origins. It has no owner. No one knows its intentions, but it seems like its purpose is to seek and destroy whatever gets in its path. Some call it the god of Africa. Some the ghost of soldiers. Only the people that see it know the truth. 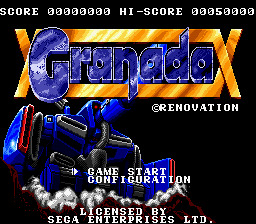 This game is one of Sega's oldest, released in 1990. It certainly doesn't look like it's from that time period. It's well worth trying. So hit Play Now and give this game a shot. Drive around as Granada and blow the bolts out of whatever gets in your way. On levels 2 and 3, beware of falling off the platform. You'll lose one of your lives.